There are a number of different types of brown spots/pigmentation that can occur on the skin. Most of these are a feature of sun damage including freckles, solar lentigines (sun spots), and flat or raised seborrheic keratoses. They are most common on the areas that receive the most sun exposure- face, hands, chest and shoulders. Apart from being a sign of general sun damage they give the appearance of aged skin. Scientific studies have shown that brown spots and pigmentation are skin changes that make the skin appear older than it really is. 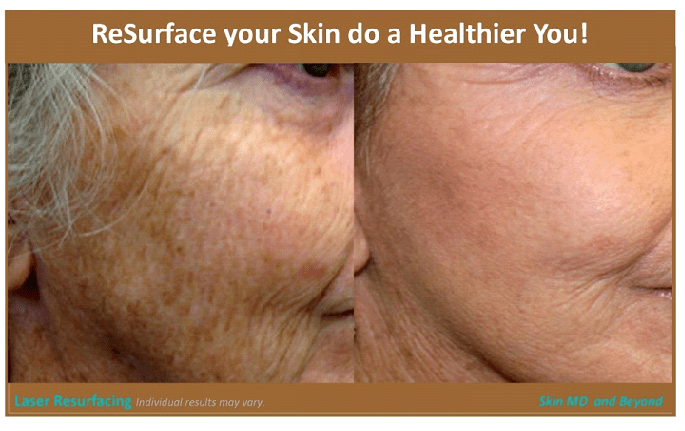 Therefore reducing pigmentation is the single most dramatic rejuvenating procedure available! There are different types of skin pigmentation, and they are usually classified by where they are located in the skin. Superficial Pigment is found in the epidermis and is located close to the surface of the skin and is usually created by exposure to the sun. This includes freckles, solar lentigines (sun spots) and seborrheic keratosis. Deep Pigmentation is usually found in the dermal (deep) layers, and include Nevus of Ota and Hori’s Macules. Mixed (dermal/epidermal) Pigmentation – These pigmentation types crosses both the superficial and deeper layers of the skin. 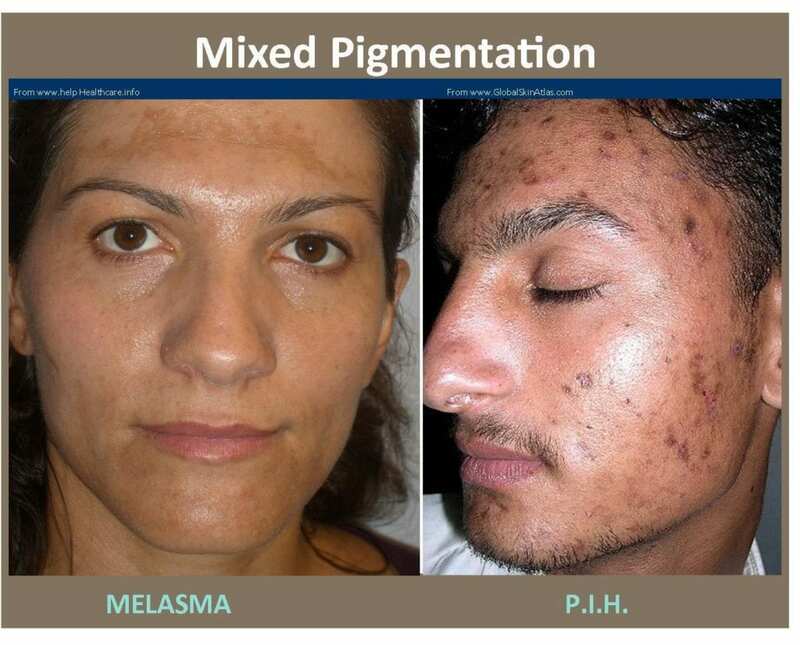 Melasma and PIH (Post Inflammatory Hyperpigmentation) are examples of this. Some people are born with freckles, and others develop as a result of sun exposure. They may fade during the winter, but they come back darker every summer if you don’t take precautions to keep the sun’s rays off of your skin. They aren’t harmful to the skin, but some people prefer to lighten or remove them for a more even complexion. Freckles will reduce with all treatment modalities available. Most patients show an improvement > 50% after treatment in their freckling as long as daily sunscreen is used. The most common forms of pigmentation changes are due to sun exposure. Solar lentigos, generally known as ‘sun spots’ are an example of this. Solar lentigos are not cancerous, and appear as flat brown ‘muddy’ patches on the areas of skin that are more exposed to the sun. They commonly occur on the cheeks, forehead, and back of hands. As they are superficial, most treatment modalities will be successful. However, more stubborn lesions will do better with the use of laser and light based treatments. Seborrheic Keratoses are also known as liver or age spots and you see them on the back of your hands, face or your trunk. They start off as flat brown spots and become raised and quite warty or will develop as a brown crusty spot or lump. Although they are usually quite distinctive being dark brown with a hard crust, they can occasionally be more flesh colored or much darker, almost black. Seborrheic Keratoses can vary a great deal in their shape. Often they are round but they can also appear as an oval, or sometimes a more irregular shape. Although they can occasionally occur singly more often than not you may find several. Cryotherapy- Liquid Nitrogen or “Freezing” the lesion off is the most common way to remove them. To remove a raised lesion by laser, an ablative laser is required. Dr. Wright uses an erbium laser. If there is any sign that a pigmented lesion is dysplastic or a melanoma or skin cancer, then a sample of the lesion or the entire lesion needs to be examined. It is not known why these Nevi occur. Nevus of Ota is much more common than Hori’s macules and both are most commonly found in the Asian populations; 0.2-0.6% of Japanese people have Nevi of Ota. They appear more frequently in females. Treatment is usually cosmetic camouflage to cover the disfiguring markings. Laser treatment (usually using 1064nm Q switched Nd:YAG or QS ruby laser) and Intense Pulsed Light (IPL) work by destroying the dermal pigment. Multiple treatments are necessary, often with a combination of devices. Laser treatment is more effective in light skinned individuals than in those with dark skin. Unfortunately recurrence is common after laser clearance, sometimes resulting in a darker hue. Nevi of Ota are colored skin markings of slate-brown or blue/grey coloring. They are unusual birthmarks in which the pigmentation is found deep in the dermis and is usually on the forehead and face around the eye area. Hori’s Macules have a similar appearance to the Nevi of Ota. However, it is not present at birth, and it often affects both sides of the face. Melasma, also known as hormonal pigmentation, is a considerable problem for Texan women, as the sun’s UVA rays are a stimulant for melanin (brown pigmentation) to develop on the skin, and unfortunately the sun can even penetrate through car window glass. It is a chronic skin condition that occurs on the face in the form of brown patches and is a dynamic (active) condition that needs lifelong management. It generally appears on the cheeks, forehead, nose and around the mouth, but it could turn up anywhere. The cause is a combination of hormones and the sun; no matter how much sun protection you use, you could still get it. The pigment cells are also heat sensitive, so if you go out in very warm weather, you’re at risk. It’s more common in pregnant women because they have high estrogen states, but it can happen to anyone. Any change in hormonal status with higher levels of estrogen is thought to trigger and aggravate the condition (i.e. birth control pills and pregnancy). Discontinuing the use of contraceptives rarely clears the pigmentation and it may last for many years after discontinuation. But, after pregnancy Melasma or pigmentation will usually clear within a few months of delivery but may it may also persist indefinitely. However many women without these risk factors also develop melasma. There are two types of Melasma and each describes how deep the pigment is in the skin and how to treat it. In the office Dr. Wright will evaluate the depth of pigment with a Wood’s lamp, which can roughly estimate if pigment is in the upper layers of skin and will be amenable to topical therapy with hydroquinone and retinoids, or if it will require a deeper treatment with a laser, light source or microneedling. As melasma has a tendency to reoccur (particularly in darker skin tones) consistent use of a retinoid and photoprotection can help prevent flares. Epidermal Melasma is the most common form and is easily treated with a combination of superficial chemical peels, IPL light base procedures. Dermal Melasma occurs when the melanin has leached into the deeper skin layer called the dermis. The deeper the pigment is -the more difficult it is to treat. Dermal melasma is not treated with superficial peels and is best treated with lasers and microneedling. PIH (Post Inflammatory Hyperpigmentation) can occur after any insult or inflammation happens to the skin. It can be caused by a skin disorder or because of a beauty or medical intervention. The inflammatory process causes a stimulation of the melanocytes (pigment-making cells) to increase the amount of melanin (pigment), in patients who are susceptible to it. This will cause a brown appearance of the skin in the area of the inflammation. Typically skin traumas that can cause PIH are burns, acne or any other physical trauma, even a scratch or irritation. Often those with olive or darker skin tones, including Asian, Mediterannean, Middle Eastern and Hispanic individuals, will be more susceptible. Also some patients who may have lighter skin tones themselves, but with a darker skin toned ancestry are also at risk. Prevention is better than cure, so patients with this predisposition to PIH should really be cautious with any beauty or cosmetic medical intervention, as PIH is always a risk. Those patients who have a history of, or are predisposed to PIH should have lightening agents prior to and after laser treatments. Also using a corticosteroid during the inflammatory phase of a procedure can be very helpful for prevention of this problem. At Skin MD and Beyond, Dr. Wright has extensive experience and success in treating patients with PIH, as well as treating “at-risk” patients who wish to have cosmetic procedures. Protect yourself from the Sun. For all pigmentation, the best way to minimize its appearance is sun protection and avoidance. Daily sunscreen usage is probably the most important intervention you could do. A broad spectrum sunscreen with titanium dioxide, zinc oxide or avobenzone is suggested. Use a strong sunscreen on the rest of your body as well, since freckles and other forms of pigmentation can develop anywhere. Make sure you cover your face every couple of hours while you’re out in the sun, and more often if you’re going swimming. Wear a hat and other protective clothing. Sunscreen can only go so far to protect your skin from the sun. Having a layer of clothing over your skin is a much more effective way to prevent pigmentation from forming. Patients who treat their pigmentation and then go back out in the sun will have a high incidence of re-pigmenting in the area that was just treated. A customized at home daily regimen consisting of medical grade skin care products to optimize treatment effects and maintain good results. Programs are customized for each patient to ensure they are using the best products for their individual skin care needs. Skin MD and Beyond offers a wide range of skin care products for all skin types and sensitivities. Dr. Wright will advise you on the treatment(s) that are most suited for your concerns. Read on to find out more on the ingredients incorporated in Fiona Wright MD Skincare and other medical-strength topicals and how they can improve your complexion by removing your pigmentation. Topical bleaching creams or agents, like arbutin, licorice extract, vitamin C, cucumber, and hydroquinone. Topical acids that exfoliate and reduce pigmentation such as azaleic acid, kojic acid, Vitamin A, resorcinol, glycolic and lactic acid. Topical anti-inflammatory products to reduce skin sensitivity and pigment stimulation such as steroids, aloe and niacinamide. If you have ever treated your pigmentation with a topical skin care, you were treating pigment found superficially in the epidermis. In general, it is much easier to treat superficial pigment and any device can provide some benefit. Dermal pigmentation conditions typically have to be treated with lasers and light sources that are able to penetrate through the epidermis and reach the roots of the problem. This is why some patients respond well to lightening creams and others do not. The ResurFX Non-Ablative Laser Resurfacing Treatment is a Fractional Laser which combines the impact of Ablative Lasers with the gentleness of Non-Ablative Lasers. This means great results without the pain, long recovery period and risk of pigmentation (the problem you are trying improve!) During treatment hundreds of tiny pixels or dots of laser energy penetrate the skin. It creates an ablative and thermal effect at the pixel area creating hundreds of “micro-injury tunnels” without disturbing the surrounding skin. These injured areas then begin the process of healing – and at this time additional topical products are applied to penetrate into the dermis, via the tunnels created, removing pigmentation and inflammation. ResurFX Laser Resurfacing diminishes deeper lying pigmentation by breaking down older previously damaged cells and remodeling the skin’s infrastructure. This gradual building of cellular scaffolding in the deeper layers helps to strengthen and promote a clear and healthy skin texture and color. A series of treatments is needed for complete improvement. To learn more click here. DermaPEN MicroNeedling can be successfully used for removing pigmentation. It can also be used for facial toning, scars, and wrinkle reduction. DermaPEN works similarly to ReSurFX laser therapy by producing “tunnels” in the skin, thus promoting collagen induction and elastin production The DermaPEN uses multiple tiny needles that vertically pierce the dermis and epidermis of the skin, where topical skin care can be delivered to the dermis to stimulate tissue remodeling and pigment break down. Results may vary depending on the individual response, the area treated, and the type of result you are looking for. Some treatments require 6 visits at 2-6 week intervals to achieve your goals. To learn more click here. Intense Pulsed Light (IPL) Treatment is a non-laser technology, which supplies a broad spectrum of light that is pulsed deep into the skin layers uses multiple wavelengths of light to gently fade the pigmented lesion. The therapeutic light energy is transformed to heat energy, heating up and destroying specific treatment targets without damaging the surrounding tissue. Specific treatment targets might include unwanted pigment, brown spots, sun damage and red facial veins. The procedure takes 20 -30 minutes and patients can immediately return to regular activity. The lesion usually fades over a 3 – 6 week period. A series of treatments is required. To learn more click here. Chemical Peels treats conditions such as Melasma and Hyperpigmentation, while improving signs of photo-aging and photo-damage. Chemical Peels are designed to either gently polish or resurface the skin by inducing a controlled exfoliation, lifting dead cells off the surface of your skin and stimulating metabolism of the cells underneath. This helps to increase new and healthier cell production and replace older cells. At Skin MD and Beyond , there are several types of Chemical Peels available – which have each been designed for different skin conditions and types. Chemical Peels also vary in strength and are classified as superficial, medium, and deep according to the level of skin they reach. During your consultation, our specially trained team will evaluate your skin type, condition and also speak with you about the results you wish to achieve, to determine the best peel for you. With a series of Chemical Peels you can quickly achieve substantial improvement in the appearance of superficial lines and uneven pigmentation, while making your skin look and feel softer, smoother, and more radiant. To learn more click here. Cryotherapy (Liquid Nitrogen) is a very effective procedure for the removal of skin lesions such as warts and seborrheic keratosis. The term cryotherapy literally means using low temperature to remove skin lesions where the most commonly used agent is Liquid Nitrogen. Liquid Nitrogen works by freezing and destroying the cells but leaving the connective tissue foundation intact. During the procedure, the lesion is frozen with liquid nitrogen to freeze and destroy the skin lesion. In essence, it is a cold burn. The skin immediately becomes white and can take a couple of minutes to return to normal skin temperate. Afterward the skin forms a blister then a crust. When the crust falls off after several days, the skin underneath has begun to repair itself. The treated area will heal with a growth of healthy skin. The new skin will contain less pigment that the original skin and should end up smooth. Some lesions may need further sessions of cryotherapy. Microdermabrasion is a superficial type of treatment using very fine crystals of aluminum oxide to remove the dead outer layer of the skin resulting in a smoother skin surface. The treatment wand gently exfoliates and clears the old skin cells from the surface, while a soft suction removes the debris and reveals the new, smooth and unblemished skin underneath. Dermal Infusion Treatments are a safe, painless, and non-invasive DermaSweep treatment that allows the skin to achieve a deep delivery of patient-specific solutions. This medically directed treatment offers a unique technology that combines several benefits in one treatment, improving skin tone and texture while removing pigmentation. DermaSweep treatments feature a customized brush system with a variable-level vacuum that gently lifts the skin, as our bristles ‘sweep away’ the dead layer of skin in a precise and controlled manner. The patented bristle tips fully eliminate the irritation that can be associated with traditional crystal systems. This innovative system, provides a customized dermal infusion at the same time, providing a powerful serum to deliver potent nourishment and ingredients to reduce pigmentation. Once cleared of debris and nourished, the living layer of your skin expands, and can now send healthy skin cells to the surface, which over time will completely transform the visible skin layer. It can reduce the appearance of acne scarring, pigmentation, and sun damage. DermaSweep with Dermal Infusion results in a clean, consistently effective treatment, and patients see a noticeable skin improvement, even after the first treatment! To learn more click here. Pigmentation disorders, being highly visible, can cause significant distress for those that suffer with it. At Skin MD and Beyond, our arsenal of topical skin-lightening ingredients, laser technologies and the latest devices for skin rejuvenation will have a powerful effect not only on the your skin’s appearance, but also on the your life and happiness! Call today and discover the New You!